The PCs want to incorporate a pirate-type element into our existing game. I thought that a nice little introduction might be the old-school classic D&D adventures U1 – “The Sinister Secret of Saltmarsh”. The first part of the adventure has them exploring a “Haunted House” only to discover that it is really a secret smuggler’s den. The second part has them assaulting the smuggler’s ship. Because our game is in 3.5 and in the Al-Qadim world, I will have to make some serious revisions. 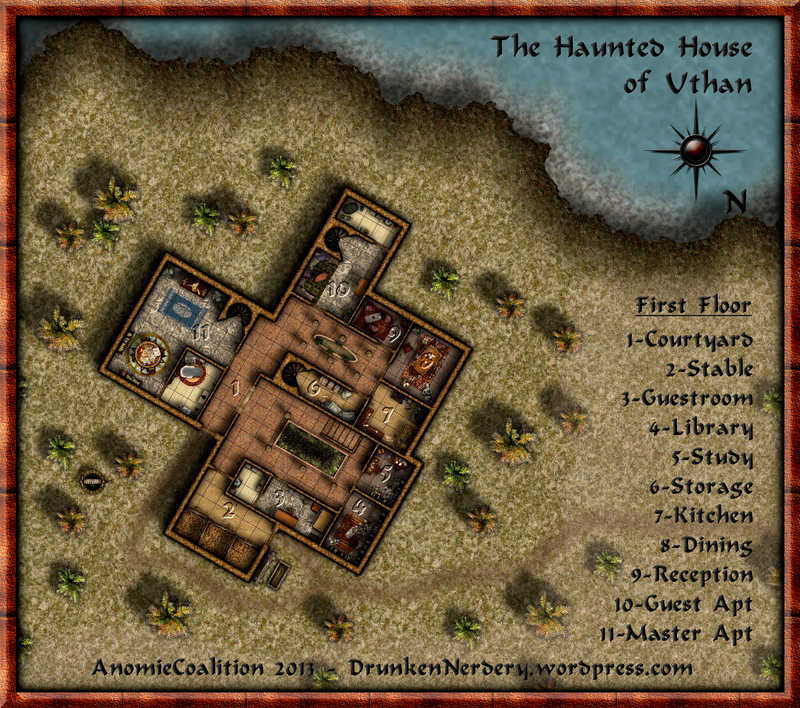 In terms of mapping, I decided to completely overhaul the original floor plan of the Haunted House in favor of one that was heavily inspired by a Mansion blue print provided in the Al-Qadim source books. In the end, it will have everything required to run this part of the adventure and more – though things will be moved around quite a bit. So without further ado – This is the first of three maps for the Haunted House (still have to do the second floor and basement). It was created in CC3 with all objects and textures found on the Duninni Forums and/or CGTextures.com. Categories: Old-School D&D Maps | Tags: CC3, Saltmarsh, U1 | Permalink.